I have clearly underestimated the excitement of fresh asphalt as the day the alley got paved, I actually took the day off of work. It’s not that I necessarily planned it that way but it was a long road in coming and I didn’t want to miss a minute. The process started in earnest 9 months ago. 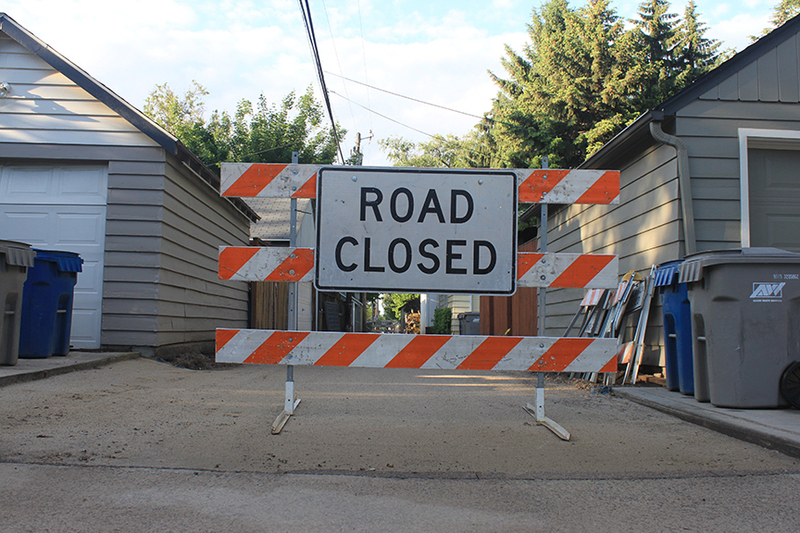 Boise has a unique situation where the roads, including alleys, are owned and maintained by the county instead of the city. 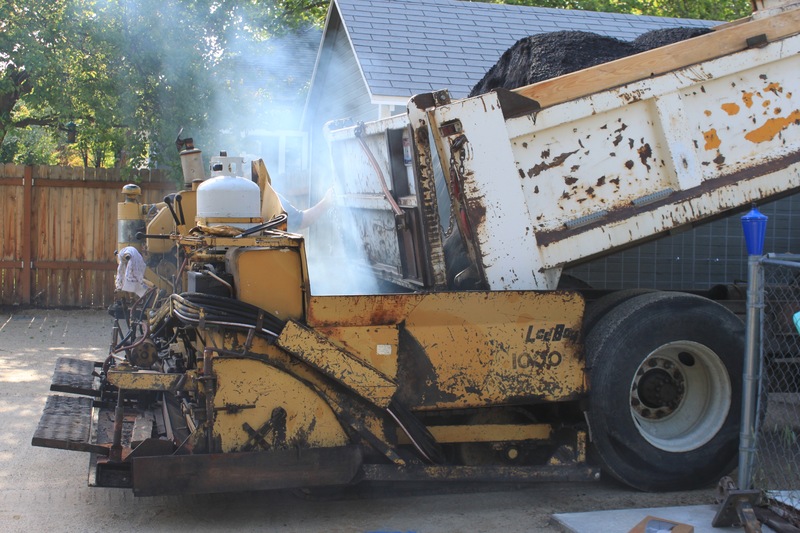 Ada County Highway District (ACHD) had a program where they would pay for the materials to pave an alley if the homeowners would pay for the labor. I say “had” because I was told we were the last alley to squeak through to receive this financial assistance and as I write this, I can no longer find the program on their website. But I think working with most government entities is a test of perseverance as a way to weed out the weak, so persevere I did. This started with filing the appropriate paperwork which including a signature representing every house on the block that they were supportive, willing to take on their financial part and would not cut into the new asphalt for 5 years. Next came relentless calls to contractors from the approved ACHD list. A neighbor started calling in the summer when building was booming and we were either ignored completely or were given bids that made my eyes water just to look at them. After a winter to work out the full alley plan, I started calling again in January. Apparently after a few months off, they liked the sound of the phone ringing. As you might imagine, Kenny and his company, KC & Sons, was our low bid by far. I’d link to his website but he doesn’t have one. When asked how he could possibly be so much lower than the other guys he said that he owns all his own equipment and while it might be old, it gets the job done. He also doesn’t advertise, so here’s my little plug for KC & Sons, although it hardly seems like they have any problem staying busy. 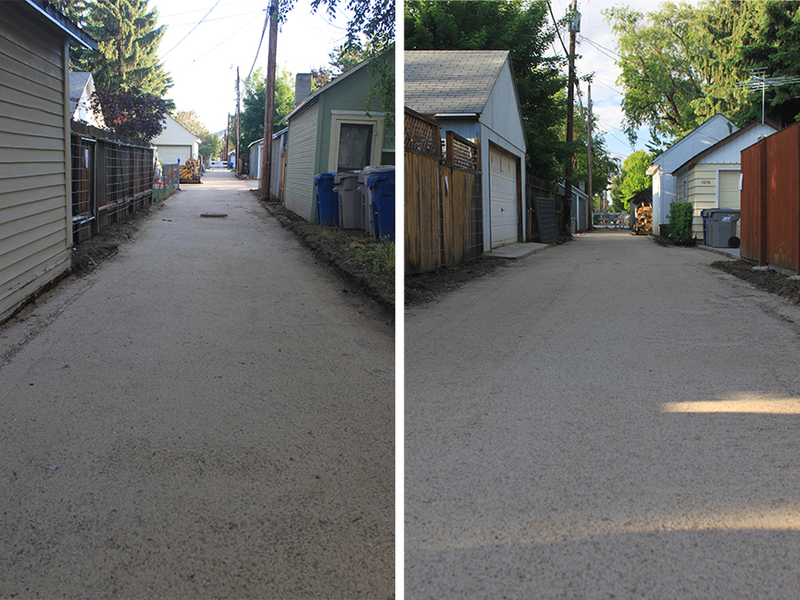 First, they did a new concrete approach on the south end of the alley as an add on per the request of ACHD. The fresh concrete was just too much temptation for me. After several days of prep during a particularly rainy spring, May 21 finally came – hereby known as the day the alley got paved. I didn’t mean to take the day off but from the minute the first truck of asphalt showed up I was mesmerized. Do you know that asphalt is 270°F when it is laid down? I was told that my flip flops weren’t appropriate footwear. That just seemed like a little guarantee they wouldn’t hand me a rake and tell me to get busy. Even a big afternoon rainstorm wasn’t enough to keep them from working on through. 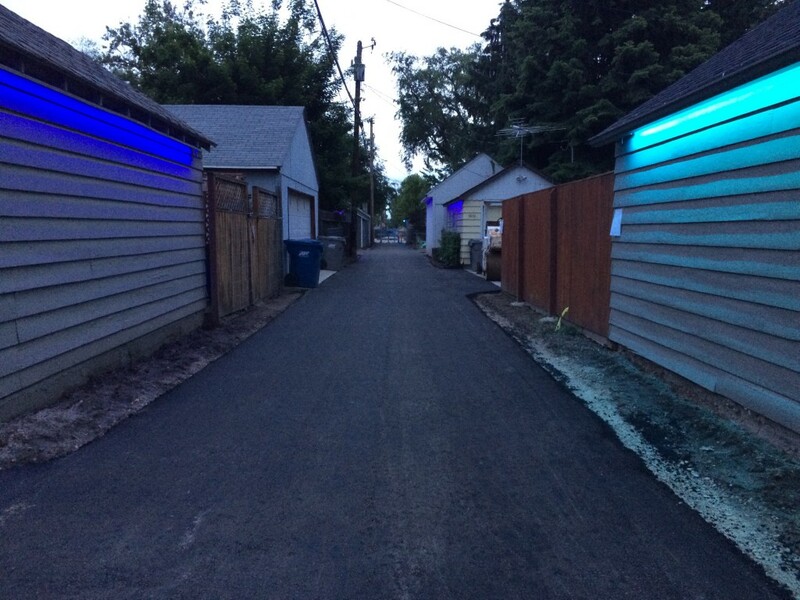 I went out at dusk that night with a glass of wine in hand to admire what had taken so long to accomplish and admired our beautifully paved alley. And it’s something I’ve done almost every night since. Who knew asphalt could be so exciting. It’s a thing of beauty! I am so envious. Yeah KC & sons. KC & Sons were absolutely the best. 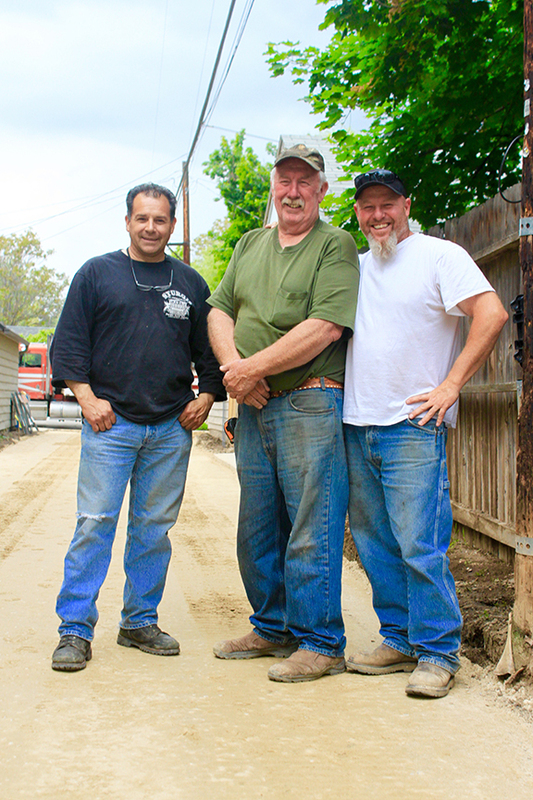 I can’t say enough nice things about Kenny and his son AJ and the beautiful paving job they did for us. I hope this email finds you well. Incredible job with this endeavor above. Can you tell me what the total cost was for the alley? Hi Lew! ACHD has a program where they pay for materials if the homeowners pay for the labor. They will supply you with a list of approved contractors. We chose KC & Sons and couldn’t be happier. Kenny and his son AJ are awesome. The labor portion was around $5500. I’m sure this number is dependent on a lot of things including length of alley as well as the amount of prep work that needs to be done. Keep in mind that this number was for the alley part only. The paved parking areas that we call the “plaza” were all paid for by the individual homeowners. Let me know if you have a any other questions. Thanks and have a great day!